Thomasburg is a small hamlet in the Municipality of Tweed in eastern Ontario. Behind my home here is a fallow field, swamp, cedar bush, old apple orchard and woods. Almost every day I take the same walk through this territory to see who's been by, and try to figure out what they've been up to. Every winter I am faced with the problem of trying to distinguish between cottontail spoor and snowshoe hare spoor. It should be easy--cottontails have rather narrow back feet, while snowshoes have feet that are, well, like snowshoes. But of course snow conditions are not always ideal, so I end up with a lot of tracks that I can't decipher. Their scats are said to differ slightly in size, but this is a little subtle to rest an identification on. Also troubling is that I've never seen a white rabbit/hare here--although I've seen many brown, grizzled, reddish, etc. ones, and since I have seen a white one, i.e., a snowshoe hare in winter coat, less than 10 km north of Thomasburg, I have no reason to suppose that this is a region where they don't change colour for the winter. (There are such regions, but if it's true that the change depends on changes in the light, I assume that they are well south of here.) I don't know that all the rabbits/hares, you know, lagomorphs, I've seen have been cottontails. In fact I've seen some I was pretty sure were not, but there aren't good field marks to tell these two species apart, except, of course, the feet. In the summer though, you need to be holding it in your arms to get a good look at those, and that opportunity doesn't present itself very often. The feet would also distinguish snowshoes from European hares and domestic rabbits, both of which might turn up here to add to the identification problems. The European hare is quite a bit bigger than the cottontail and has longer ears than the snowshoe, as well as different feet. The domestic rabbit though takes many forms. In summer I identify rabbits/hares by sight as cottontail or "Gee, I don't think that is a cottontail." Cottontail is by far the most common summer sight of the two. But we did have excellent conditions for tracks a week ago, and I managed to get this photo of what is clearly a snowshoe track. Notice the spread toes on the hind feet (front of the track). Then the last couple of mornings there has been a veritable sea of lagomorph tracks in the yard--converging under the bird feeders, some suggestive of snowshoe, some not so much, but nothing so definitive as the track pictured here. But I found another sign this morning that I have read is sign of the snowshoe. Porphyrins are components of hemoglobin. I don't know what is fed to domestic rabbits that contains this, but the only source I can think of for wild rabbits/hares is carrion or bloody snow. This is something that would be available to them occasionally, and one that they will partake of when they can (as many, if not most, herbivores will). 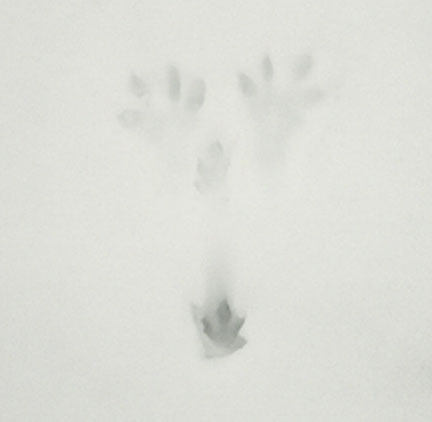 But this makes me think that this is not particularly a sign of snowshoe hares. I don't know what "elevated urobilin" means, or whether it is a sign of illness. I'm guessing that this orange/red urine sign is in one guide and not the other two because it is not a "safe" generalization about snowshoe hares, but rather something that Richard P. Smith himself frequently observed wherever it was that he tracked snowshoes. I refer to three guides to animal tracks (and scats, etc.) because each author brings something different to his work: A different perspective, experience, emphasis. And each is illustrated differently. Smith's book is illustrated with photographs, the other two with sketches (McDougall also has photographs of representatives of some of the species he covers.). The sketches in Murie's book are from life, in McDougall they are simplified to bring out the main feature he wants you to look for. Each talks about actual experiences he's had with the various animals, and each talks about identifying species by tracks and other spoor in general. With three guides available the chances are better that I'll find something that gives me some clue about whatever I'm trying to identify. I wish I had five. So, I know that there is at least one snowshoe coming around. I know that there are at least two, and probably more, hares and rabbits visiting the feeders at night this week. And I should mention that right by the big red pee stain there was a smaller pale yellow stain. 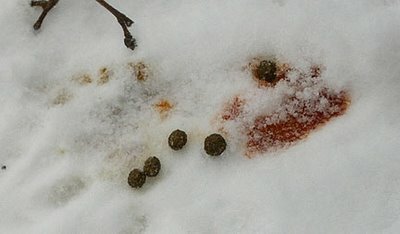 But I don't know yet whether red (orange) pee is a sign of the snowshoe hare, or a lagomorph with a fancy diet. Wow. First blue pee, now red. Until this week I had no idea that rabbits and hares had rainbows in their bladders. My my. All this focus on rabbit pee in one week! At first, I thought this post was another Little Brown Bunnies or Confusing Fall Wabbits story, but it sounds like you've got the snowshoe/cottontail differentiation down. I bet the orange color can be from a porphyrin pigment that was originally part of chlorophyll molecule in green plant tissues. Clare, thanks for the comment. Yes, rainbow bladders--but it may be a result in part (here's some rank speculation) of their very fancy digestive systems--they can survive the winter on wood if they have to, and eat everything, or most things twice to get every last bit of goodness. Troutgrrrl, that's wonderful! Thank you. I had no idea that there was a porphyrin pigment in chlorophyll. You've given me a new direction for the exploration of this phenomenon! 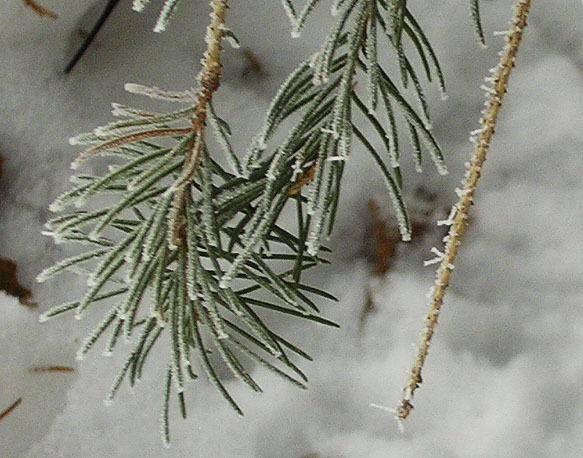 That icefog photo's a lovely shot, Pamela. Hard to imagine here right now, although it snowed in southern NZ a few days ago; an event peculiar enough to hit the national news. We have just the common european rabbit and hare here; both introduced, and both considered pests. In the North Island there's seldom any chance of examining tracks in the snow, but the most likely candidate for lagomorph snowtrack-maker would be a hare because their range extends much higher, into the subalpine zone. Despite their pest status, I love watching, or even just glimpsing, hares. You put way more thought into this than I! I say, "Rabbit," or "Big Rabbit!" Although I can attest that our now gone pet bunny, a mini-Rex, did indeed pee red. If we'd get any snow, I could join in on the colorful pee tracking, too. Aw man, I feel so left out down here in Alabama, where it seems like I'm never going to get a chance to check out colored rabbit pee. It just refuses to snow!